This article is about the Japanese conglomerate. For other uses, see Sony (disambiguation). "Sony Corporation" redirects here. For the U.S. subsidiary, see Sony Corporation of America. Sony Corporation (ソニー株式会社, Sonī Kabushiki Kaisha, /ˈsoʊni/ SOH-nee, stylized as SONY) is a Japanese multinational conglomerate corporation headquartered in Kōnan, Minato, Tokyo. Its diversified business includes consumer and professional electronics, gaming, entertainment and financial services. The company owns the largest music entertainment business in the world, the largest video game console business and one of the largest video game publishing businesses, and is one of the leading manufacturers of electronic products for the consumer and professional markets, and a leading player in the film and television entertainment industry. [better source needed] Sony was ranked 97th on the 2018 Fortune Global 500 list. ^ a b c "Annual Report 2017" (PDF) (Press release). Sony Corp. 31 March 2017. Retrieved 23 October 2017. Sony Corporation is the electronics business unit and the parent company of the Sony Group (ソニー・グループ, Sonī Gurūpu), which is engaged in business through its four operating components: electronics (AV, IT & communication products, semiconductors, video games, network services and medical business), motion pictures (movies and TV shows), music (record labels and music publishing) and financial services (banking and insurance). These make Sony one of the most comprehensive entertainment companies in the world. The group consists of Sony Corporation, Sony Pictures, Sony Mobile, Sony Interactive Entertainment, Sony Music, Sony/ATV Music Publishing, Sony Financial Holdings, and others. Sony is among the semiconductor sales leaders and since 2015, the fifth-largest television manufacturer in the world after Samsung Electronics, LG Electronics, TCL and Hisense. The company's current slogan is Be Moved. Their former slogans were The One and Only (1979–1982), It's a Sony (1982–2005), like.no.other (2005–2009) and make.believe (2009–2013). Sony has a weak tie to the Sumitomo Mitsui Financial Group (SMFG) corporate group, the successor to the Mitsui group. Sony began in the wake of World War II. In 1946, Masaru Ibuka started an electronics shop in a department store building in Tokyo. The company started with a capital of ¥190,000 and a total of eight employees. In May 1946, Ibuka was joined by Akio Morita to establish a company called Tokyo Tsushin Kogyo (東京通信工業, Tōkyō Tsūshin Kōgyō) (Tokyo Telecommunications Engineering Corporation). The company built Japan's first tape recorder, called the Type-G. In 1958, the company changed its name to "Sony". When Tokyo Tsushin Kogyo was looking for a romanized name to use to market themselves, they strongly considered using their initials, TTK. The primary reason they did not is that the railway company Tokyo Kyuko was known as TTK. The company occasionally used the acronym "Totsuko" in Japan, but during his visit to the United States, Morita discovered that Americans had trouble pronouncing that name. Another early name that was tried out for a while was "Tokyo Teletech" until Akio Morita discovered that there was an American company already using Teletech as a brand name. The name "Sony" was chosen for the brand as a mix of two words: one was the Latin word "sonus", which is the root of sonic and sound, and the other was "sonny", a common slang term used in 1950s America to call a young boy. In 1950s Japan, "sonny boys" was a loan word in Japanese, which connoted smart and presentable young men, which Sony founders Akio Morita and Masaru Ibuka considered themselves to be. The first Sony-branded product, the TR-55 transistor radio, appeared in 1955 but the company name did not change to Sony until January 1958. According to Schiffer, Sony's TR-63 radio "cracked open the U.S. market and launched the new industry of consumer microelectronics." By the mid-1950s, American teens had begun buying portable transistor radios in huge numbers, helping to propel the fledgling industry from an estimated 100,000 units in 1955 to 5 million units by the end of 1968. Sony co-founder Akio Morita founded Sony Corporation of America in 1960. In the process, he was struck by the mobility of employees between American companies, which was unheard of in Japan at that time. When he returned to Japan, he encouraged experienced, middle-aged employees of other companies to reevaluate their careers and consider joining Sony. The company filled many positions in this manner, and inspired other Japanese companies to do the same. Moreover, Sony played a major role in the development of Japan as a powerful exporter during the 1960s, 1970s and 1980s. It also helped to significantly improve American perceptions of "made in Japan" products. Known for its production quality, Sony was able to charge above-market prices for its consumer electronics and resisted lowering prices. In 1971, Masaru Ibuka handed the position of president over to his co-founder Akio Morita. Sony began a life insurance company in 1979, one of its many peripheral businesses. Amid a global recession in the early 1980s, electronics sales dropped and the company was forced to cut prices. Sony's profits fell sharply. "It's over for Sony," one analyst concluded. "The company's best days are behind it." Around that time, Norio Ohga took up the role of president. He encouraged the development of the Compact Disc in the 1970s and 1980s, and of the PlayStation in the early 1990s. Ohga went on to purchase CBS Records in 1988 and Columbia Pictures in 1989, greatly expanding Sony's media presence. Ohga would succeed Morita as chief executive officer in 1989. Under the vision of co-founder Akio Morita and his successors, the company had aggressively expanded into new businesses. Part of its motivation for doing so was the pursuit of "convergence," linking film, music and digital electronics via the Internet. This expansion proved unrewarding and unprofitable, threatening Sony's ability to charge a premium on its products as well as its brand name. In 2005, Howard Stringer replaced Nobuyuki Idei as chief executive officer, marking the first time that a foreigner had run a major Japanese electronics firm. Stringer helped to reinvigorate the company's struggling media businesses, encouraging blockbusters such as Spider-Man while cutting 9,000 jobs. He hoped to sell off peripheral business and focus the company again on electronics. Furthermore, he aimed to increase cooperation between business units, which he described as "silos" operating in isolation from one another. In a bid to provide a unified brand for its global operations, Sony introduced a slogan known as "make.believe" in 2009. Despite some successes, the company faced continued struggles in the mid- to late-2000s. In 2012, Kazuo Hirai was promoted to president and CEO, replacing Stringer. Shortly thereafter, Hirai outlined his company-wide initiative, named "One Sony" to revive Sony from years of financial losses and bureaucratic management structure, which proved difficult for former CEO Stringer to accomplish, partly due to differences in business culture and native languages between Stringer and some of Sony's Japanese divisions and subsidiaries. Hirai outlined three major areas of focus for Sony's electronics business, which include imaging technology, gaming and mobile technology, as well as a focus on reducing the major losses from the television business. In February 2014, Sony announced the sale of its Vaio PC division to a new corporation owned by investment fund Japan Industrial Partners and spinning its TV division into its own corporation as to make it more nimble to turn the unit around from past losses totaling $7.8 billion over a decade. Later that month, they announced that they would be closing 20 stores. In April, the company announced that they would be selling 9.5 million shares in Square Enix (roughly 8.2 percent of the game company's total shares) in a deal worth approximately $48 million. In May 2014 the company announced it was forming two joint ventures with Shanghai Oriental Pearl Group to manufacture and market Sony's PlayStation games consoles and associated software in China. It was reported in December 2016 by multiple news outlets that Sony was considering restructuring its U.S. operations by merging its TV & film business, Sony Pictures Entertainment, with its gaming business, Sony Interactive Entertainment. According to the reports, such a restructuring would have placed Sony Pictures under Sony Interactive's CEO, Andrew House, though House wouldn't have taken over day-to-day operations of the film studio. According to one report, Sony was set to make a final decision on the possibility of the merger of the TV, film, & gaming businesses by the end of its fiscal year in March of the following year (2017). Sony has historically been notable for creating its own in-house standards for new recording and storage technologies, instead of adopting those of other manufacturers and standards bodies. Sony (either alone or with partners) has introduced several of the most popular recording formats, including the floppy disk, Compact Disc and Blu-ray Disc. The company launched the Betamax videocassette recording format in 1975. Sony was involved in the videotape format war of the early 1980s, when they were marketing the Betamax system for video cassette recorders against the VHS format developed by JVC. In the end, VHS gained critical mass in the marketbase and became the worldwide standard for consumer VCRs. Betamax is, for all practical purposes, an obsolete format. Sony's professional-oriented component video format called Betacam, which was derived from Betamax, was used until 2016 when Sony announced it was stopping production of all remaining 1/2-inch video tape recorders and players, including the Digital Betacam format. In 1985, Sony launched their Handycam products and the Video8 format. Video8 and the follow-on hi-band Hi8 format became popular in the consumer camcorder market. In 1987 Sony launched the 4 mm DAT or Digital Audio Tape as a new digital audio tape standard. In 1979, the Walkman brand was introduced, in the form of the world's first portable music player using the compact cassette format. Sony introduced the MiniDisc format in 1992 as an alternative to Philips DCC or Digital Compact Cassette and as a successor to the compact cassette. Since the introduction of MiniDisc, Sony has attempted to promote its own audio compression technologies under the ATRAC brand, against the more widely used MP3. Until late 2004, Sony's Network Walkman line of digital portable music players did not support the MP3 standard natively. In 2004, Sony built upon the MiniDisc format by releasing Hi-MD. Hi-MD allows the playback and recording of audio on newly introduced 1 GB Hi-MD discs in addition to playback and recording on regular MiniDiscs. In addition to saving audio on the discs, Hi-MD allows the storage of computer files such as documents, videos and photos. In 1993, Sony challenged the industry standard Dolby Digital 5.1 surround sound format with a newer and more advanced proprietary motion picture digital audio format called SDDS (Sony Dynamic Digital Sound). This format employed eight channels (7.1) of audio opposed to just six used in Dolby Digital 5.1 at the time. Ultimately, SDDS has been vastly overshadowed by the preferred DTS (Digital Theatre System) and Dolby Digital standards in the motion picture industry. SDDS was solely developed for use in the theatre circuit; Sony never intended to develop a home theatre version of SDDS. Sony and Philips jointly developed the Sony-Philips digital interface format (S/PDIF) and the high-fidelity audio system SACD. The latter became entrenched in a format war with DVD-Audio. Neither gained a major foothold with the general public. CDs were preferred by consumers because of the ubiquitous presence of CD drives in consumer devices until the early 2000s when the iPod and streaming services became available. In 1983, Sony followed their counterpart Philips to the compact disc (CD). In addition to developing consumer-based recording media, after the launch of the CD Sony began development of commercially based recording media. In 1986 they launched Write-Once optical discs (WO) and in 1988 launched Magneto-optical discs which were around 125MB size for the specific use of archival data storage. In 1984, Sony launched the Discman series which extended their Walkman brand to portable CD products. In the early 1990s, two high-density optical storage standards were being developed: one was the MultiMedia Compact Disc (MMCD), backed by Philips and Sony, and the other was the Super Density disc (SD), supported by Toshiba and many others. Philips and Sony abandoned their MMCD format and agreed upon Toshiba's SD format with only one modification. The unified disc format was called DVD and was introduced in 1997. 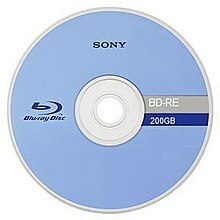 Sony was one of the leading developers of the Blu-ray optical disc format, the newest standard for disc-based content delivery. The first Blu-ray players became commercially available in 2006. The format emerged as the standard for HD media over the competing format, Toshiba's HD DVD, after a two-year-long high-definition optical disc format war. In 1983, Sony introduced 90 mm micro diskettes (better known as 3.5-inch (89 mm) floppy disks), which it had developed at a time when there were 4" floppy disks, and a lot of variations from different companies, to replace the then on-going 5.25" floppy disks. Sony had great success and the format became dominant. 3.5" floppy disks gradually became obsolete as they were replaced by current media formats. Sony launched in 1998, their Memory Stick format, flash memory cards for use in Sony lines of digital cameras and portable music players. It has seen little support outside of Sony's own products, with Secure Digital cards (SD) commanding considerably greater popularity. Sony has made updates to the Memory Stick format with Memory Stick Duo and Memory Stick Micro. 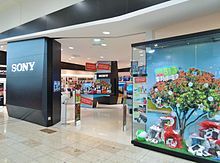 Sony offers products in a variety of product lines around the world. Sony has developed a music playing robot called Rolly, dog-shaped robots called AIBO and a humanoid robot called QRIO. As of 1 April 2016, Sony is organized into the following business segments: Mobile Communications (MC), Game & Network Services (G&NS), Imaging Products & Solutions (IP&S), Home Entertainment & Sound (HE&S), Semiconductors, Components, Pictures, Music, Financial Services and All Other. The network and medical businesses are included in the G&NS and IP&S, respectively. Sony Corporation is the electronics business unit and the parent company of the Sony Group. It primarily conducts strategic business planning of the group, research and development (R&D), planning, designing and marketing for electronics products. Its subsidiaries such as Sony Global Manufacturing & Operations Corporation (SGMO; 4 plants in Japan), Sony Semiconductor Manufacturing Corporation (7 plants in Japan), Sony Storage Media and Devices Corporation, Sony Energy Devices Corporation and its subsidiaries outside Japan (Brazil, China, UK (Wales), India, Malaysia, Singapore, South Korea, Thailand, Ireland and United States) are responsible for manufacturing as well as product engineering (SGMO[clarification needed] is also responsible for customer service operations). In 2012, Sony rolled most of its consumer content services (including video, music and gaming) into the Sony Entertainment Network. Sony produced the world's first portable music player, the Walkman in 1979. This line fostered a fundamental change in music listening habits by allowing people to carry music with them and listen to music through lightweight headphones. Walkman originally referred to portable audio cassette players. The company now uses the Walkman brand to market its portable audio and video players as well as a line of former Sony Ericsson mobile phones. Sony utilized a related brand, Discman, to refer to its CD players. It dropped this name in the late 1990s. Sony produced computers (MSX home computers and NEWS workstations) during the 1980s. The company withdrew from the computer business around 1990. Sony entered again into the global computer market under the new VAIO brand, began in 1996. Short for "Video Audio Integrated Operation", the line was the first computer brand to highlight visual-audio features. Sony faced considerable controversy when some of its laptop batteries exploded and caught fire in 2006, resulting in the largest computer-related recall to that point in history. In a bid to join the tablet computer market, the company launched its Sony Tablet line of Android tablets in 2011. Since 2012, Sony's Android products have been marketed under the Xperia brand used for its smartphones. On 4 February 2014, Sony announced that it would sell its VAIO PC business due to poor sales and Japanese company Japan Industrial Partners (JIP) will purchase the VAIO brand, with the deal finalized by the end of March 2014. Sony maintains a minority stake in the new, independent company. Sony offers a wide range of digital cameras. Point-and-shoot models adopt the Cyber-shot name, while digital single-lens reflex models are branded using Alpha. The first Cyber-shot was introduced in 1996. At the time, digital cameras were a relative novelty. Sony's market share of the digital camera market fell from a high of 20% to 9% by 2005. Sony entered the market for digital single-lens reflex cameras in 2006 when it acquired the camera business of Konica Minolta. Sony rebranded the company's line of cameras as its Alpha line. Sony is the world's third largest manufacturer of the cameras, behind Canon and Nikon respectively. There are also a variety of Camcorders which are manufactured by Sony. In 1968, Sony introduced the Trinitron brand name for its lines of aperture grille cathode ray tube televisions and (later) computer monitors. Sony stopped production of Trinitron for most markets, but continued producing sets for markets such as Pakistan, Bangladesh and China. Sony discontinued its series of Trinitron computer monitors in 2005. The company discontinued the last Trinitron-based television set in the US in early 2007. The end of Trinitron marked the end of Sony's analog television sets and monitors. Sony used the LCD WEGA name for its LCD TVs until summer 2005. The company then introduced the BRAVIA name. BRAVIA is an in house brand owned by Sony which produces high-definition LCD televisions, projection TVs and front projectors, home cinemas and the BRAVIA home theatre range. All Sony high-definition flat-panel LCD televisions in North America have carried the logo for BRAVIA since 2005. Sony is the third-largest maker of televisions in the world. As of 2012[update], Sony's television business has been unprofitable for eight years. In December 2011, Sony agreed to sell all stake in an LCD joint venture with Samsung Electronics for about $940 million. 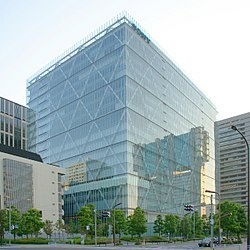 On 28 March 2012, Sony Corporation and Sharp Corporation announced that they have agreed to further amend the joint venture agreement originally executed by the parties in July 2009, as amended in April 2011, for the establishment and operation of Sharp Display Products Corporation ("SDP"), a joint venture to produce and sell large-sized LCD panels and modules. On 9 November 2015, Sony announced that they are going to stop producing Betamax Tapes in March 2016. Sony also sells a range of DVD players. It has shifted its focus in recent years to promoting the Blu-ray format, including discs and players. Sony produces a wide range of semiconductors and electronic components including image sensors (Exmor), image processor (BIONZ), laser diodes, system LSIs, mixed-signal LSIs, OLED panels, etc. The company has a strong presence in the image sensor market. Sony-manufactured CMOS image sensors are widely used in digital cameras, tablet computers and smartphones. In April 2018, Sony announced to join the market for satellite communications and develop laser communication products for small satellites. Sony wants to use its heritage with optical disc technology used in products like CD players and plans to start initial tests in collaboration with JAXA in 2018. Sony has targeted medical, healthcare and biotechnology business as a growth sector in the future. The company acquired iCyt Mission Technology, Inc. (renamed Sony Biotechnology Inc. in 2012), a manufacture of flow cytometers, in 2010 and Micronics, Inc., a developer of microfluidics-based diagnostic tools, in 2011. In 2012, Sony announced that it will acquire all shares of So-net Entertainment Corporation, which is the majority shareholder of M3, Inc., an operator of portal sites (m3.com, MR-kun, MDLinx and MEDI:GATE) for healthcare professionals. On 28 September 2012, Olympus and Sony announced that the two companies will establish a joint venture to develop new surgical endoscopes with 4K resolution (or higher) and 3D capability. Sony Olympus Medical Solutions Inc. (Sony 51%, Olympus 49%) was established on 16 April 2013. On 28 February 2014, Sony, M3 and Illumina established a joint venture called P5, Inc. to provide a genome analysis service for research institutions and enterprises in Japan. Xperia, the product device name for a range of smartphones from Sony. Sony Mobile Communications Inc. (formerly Sony Ericsson) is a multinational mobile phone manufacturing company headquartered in Tokyo, Japan and a wholly owned subsidiary of Sony Corporation. In 2001, Sony entered into a joint venture with Swedish telecommunications company Ericsson, forming Sony Ericsson. Initial sales were rocky, and the company posted losses in 2001 and 2002. However, SMC reached a profit in 2003. Sony Ericsson distinguished itself with multimedia-capable mobile phones, which included features such as cameras. These were unusual for the time. Despite their innovations, SMC faced intense competition from Apple's iPhone which released in 2007. From 2008 to 2010, amid a global recession, SMC slashed its workforce by several thousand. Sony acquired Ericsson's share of the venture in 2012 for over US$1 billion. In 2009, SMC was the fourth-largest mobile phone manufacturer in the world (after Nokia, Samsung and LG). By 2010, its market share had fallen to sixth place. Sony Mobile Communications now focuses exclusively on the smartphone market under the Xperia name. In 2015, Sony released Xperia Z5 Premium in Canada following US and Europe. In the year 2013, Sony contributed to around two percent of the mobile phone market with 37 million mobile phones sold. Sony Interactive Entertainment headquarters in San Mateo, California. Sony Interactive Entertainment (formerly Sony Computer Entertainment) is best known for producing the popular line of PlayStation consoles. The line grew out of a failed partnership with Nintendo. Originally, Nintendo requested Sony to develop an add-on for its console that would play Compact Discs. In 1991 Sony announced the add-on, as well as a dedicated console known as the "Play Station". However, a disagreement over software licensing for the console caused the partnership to fall through. Sony then continued the project independently. Launched in 1994, the first PlayStation gained 61% of global console sales and broke Nintendo's long-standing lead in the market. Sony followed up with the PlayStation 2 in 2000, which was even more successful. The console has become the most successful of all time, selling over 150 million units as of 2011[update]. Sony released the PlayStation 3, a high-definition console, in 2006. It was the first console to use the Blu-ray format, and was considerably more expensive than competitors Xbox 360 and Wii due to a Cell processor. Early on, poor sales performance resulted in significant losses for the company, pushing it to sell the console at a loss. The PlayStation 3 sold generally more poorly than its competitors in the early years of its release but managed to overtake the Xbox 360 in global sales later on. It later introduced the PlayStation Move, an accessory that allows players to control video games using motion gestures. The PlayStation 2 is the best-selling video game console of all time. Sony extended the brand to the portable games market in 2004 with the PlayStation Portable (PSP). The console has sold reasonably, but has taken a second place to a rival handheld, the Nintendo DS. Sony developed the Universal Media Disc (UMD) optical disc medium for use on the PlayStation Portable. Early on, the format was used for movies, but it has since lost major studio support. Sony released a disc-less version of its PlayStation Portable, the PSP Go, in 2009. The company went on to release its second portable video game system, PlayStation Vita, in 2011 and 2012. Sony launched its fourth console, the PlayStation 4, on 15 November 2013, which as of 31 December 2017 has sold 73.6 million units globally. On 18 March 2014, at GDC, president of Sony Computer Entertainment Worldwide Studios Shuhei Yoshida announced their new virtual reality technology dubbed Project Morpheus, and later named PlayStation VR, for PlayStation 4. The headset brought VR gaming and non-gaming software to the company's console. According to a report released by Houston-based patent consulting firm LexInnova in May 2015, Sony is leading the virtual reality patent race. According to the firm's analysis of nearly 12,000 patents or patent applications, Sony has 366 virtual reality patents or patent applications. PlayStation VR was released worldwide on 13 October 2016. In 2014, Sony participated within NRG Energy eVgo Ready for Electric Vehicle (REV) program, for EV charging parking lots. Sony is in the business of electric vehicle lithium-ion batteries. IT giants such as Google (driverless car) and Apple (iCar/Project Titan) are working on electric vehicles and self driving cars, competing with Tesla; Sony is entering into this field by investing $842,000 in the ZMP company. On 28 July 2016, Sony announced that the company will sell its battery business to Murata Manufacturing. Sony Entertainment has three divisions: Sony Pictures Entertainment, Sony Music Entertainment, and Sony/ATV Music Publishing. Sony USA also previously owned and operated Sony Trans Com: a technology business that provided in-flight entertainment programming as well as video and audio playback equipment for the airline industry. Sony had purchased the business from Sundstrand Corp. in 1989 and subsequently sold it to Rockwell Collins in 2000. Sony Pictures Entertainment Inc. (SPE) is the television and film production/distribution unit of Sony. With 12.5% box office market share in 2011, the company was ranked third among movie studios. Its group sales in 2010 were US$7.2 billion. The company has produced many notable movie franchises, including Spider-Man, The Karate Kid and Men in Black. It has also produced the popular television game shows Jeopardy! and Wheel of Fortune. Sony entered the television and film production market when it acquired Columbia Pictures Entertainment in 1989 for $3.4 billion. Columbia lives on in the Sony Pictures Motion Picture Group, a division of SPE which in turn owns Columbia Pictures and TriStar Pictures among other film production and distribution companies such as Screen Gems, Sony Pictures Classics, Sony Pictures Home Entertainment. 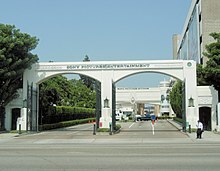 SPE's television division is known as Sony Pictures Television. For the first several years of its existence, Sony Pictures Entertainment performed poorly, leading many to suspect the company would sell off the division. 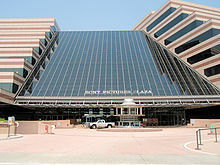 Sony Pictures Entertainment encountered controversy in the early 2000s. In July 2000, a marketing executive working for Sony Corporation created a fictitious film critic, David Manning, who gave consistently good reviews for releases from Sony subsidiary Columbia Pictures that generally received poor reviews amongst real critics. Sony later pulled the ads, suspended Manning's creator and his supervisor and paid fines to the state of Connecticut and to fans who saw the reviewed films in the US. In 2006 Sony started using ARccOS Protection on some of their film DVDs, but later issued a recall. In late 2014, Sony Pictures became the target of a hack attack from a clandestine group called Guardians of Peace, weeks before releasing the anti-North Korean comedy film The Interview. Sony Music Entertainment (also known as SME or Sony Music) is the second-largest global recorded music company of the "big three" record companies and is controlled by Sony Corporation of America, the United States subsidiary of Japan's Sony. In one of its largest-ever acquisitions, Sony purchased CBS Record Group in 1988 for US$2 billion. In the process, Sony partnered and gained the rights to the ATV catalogue of Michael Jackson, considered by the Guinness Book of World Records to be the most successful entertainer of all time. The acquisition of CBS Records provided the foundation for the formation of Sony Music Entertainment, which Sony established in 1991. In 2004, Sony entered into a joint venture with Bertelsmann AG, merging Sony Music Entertainment with Bertelsmann Music Group to create Sony BMG. In 2005, Sony BMG faced a copy protection scandal, because its music CDs had installed malware on users' computers that was posing a security risk to affected customers. In 2007, the company acquired Famous Music for US$370 million, gaining the rights to the catalogues of Eminem and Akon, among others. Sony purchased digital music recognition company Gracenote for US$260 million in 2008. Tribune Media Company acquired Gracenote from Sony in 2014 for $170 million. Besides its record label, Sony operates other music businesses. In 1995, Sony merged its publisher with Michael Jackson's ATV Music Publishing, forming Sony/ATV Music Publishing. At the time, the publishing company was the second largest of its kind in the world. The company owns the publishing rights to over 4 million compositions, including The Beatles' Lennon-McCartney catalogue, Bob Dylan, Eminem, Lady Gaga, Sam Smith, Ed Sheeran, and Taylor Swift. In 2012, Sony/ATV then acquired a majority stake in EMI Music Publishing, making them the world's largest music publishing company. As of 2016, Sony owns all of Sony/ATV. Sony Financial Holdings is a holding company for Sony's financial services business. It owns and oversees the operation of Sony Life (in Japan and the Philippines), Sony Assurance, Sony Bank and Sony Bank Securities. The company is headquartered in Tokyo, Japan. Sony Financial accounts for half of Sony's global earnings. The unit proved the most profitable of Sony's businesses in fiscal year 2006, earning $1.7 billion in profit. Sony Financial's low fees have aided the unit's popularity while threatening Sony's premium brand name. Sony wants to contend with Apple and Samsung on mobile payments in Asia. Sony plans to use its contact-less payment technology to make ground in the public transportation industry across Asia. The system, known as FeliCa, relies on two forms of technologies to make it viable, either chips embedded in smartphones or plastic cards with chips embedded in them. Sony plans to implement this technology in train systems in Indonesia as early as Spring 2016. Sony is a kabushiki gaisha registered to the Tokyo Stock Exchange in Japan and the New York Stock Exchange for overseas trading. As of 30 September 2017, there are 484,812 shareholders and 1,264,649,260 shares issued. Most of these shares are held by foreign institutions and investors. 10.7% (136,130,000): Japan Trustee Services Bank, Ltd.
6.1% (77,467,000): JPMorgan Chase & Co.
5.6% (70,720,000): The Master Trust Bank of Japan, Ltd.
Sony is one of Japan's largest corporations by revenue. It had revenues of ¥6.493 trillion in 2012. It also maintains large reserves of cash, with ¥895 billion on hand as of 2012. In May 2012, Sony shares were valued at about $15 billion. The company was immensely profitable throughout the 1990s and early 2000s, in part because of the success of its new PlayStation line. The company encountered financial difficulty in the mid- to late-2000s due to a number of factors: the global financial crisis, increased competition for PlayStation, and the devastating Japanese earthquake of 2011. The company faced three consecutive years of losses leading up to 2011. While noting the negative effects of intervening circumstances such as natural disasters and fluctuating currency exchange rates, the Financial Times criticized the company for its "lack of resilience" and "inability to gauge the economy." The newspaper voiced skepticism about Sony's revitalization efforts, given a lack of tangible results. In September 2000 Sony had a market capitalization of $100 billion; but by December 2011 it had plunged to $18 billion, reflecting falling prospects for Sony but also reflecting grossly inflated share prices of the 'dot.com' years. Net worth, as measured by stockholder equity, has steadily grown from $17.9 billion in March 2002 to $35.6 billion through December 2011. Earnings yield (inverse of the price to earnings ratio) has never been more than 5% and usually much less; thus Sony has always traded in over-priced ranges with the exception of the 2009 market bottom. On 9 December 2008, Sony Corporation announced that it would be cutting 8,000 jobs, dropping 8,000 contractors and reducing its global manufacturing sites by 10% to save $1.1 billion per year. In April 2012, Sony announced that it would reduce its workforce by 10,000 (6% of its employee base) as part of CEO Hirai's effort to get the company back into the black. This came after a loss of 520 billion yen (roughly US$6.36 billion) for fiscal 2012, the worst since the company was founded. Accumulation loss for the past four years was 919.32 billion-yen. Sony planned to increase its marketing expenses by 30% in 2012. 1,000 of the jobs cut come from the company's mobile phone unit's workforce. 700 jobs will be cut in the 2012–2013 fiscal year and the remaining 300 in the following fiscal year. In January 2013, Sony announced it was selling its US headquarters building for $1.1 billion to a consortium led by real estate developer The Chetrit Group. On 28 January 2014, Moody's Investors Services dropped Sony's credit rating to Ba1—"judged to have speculative elements and a significant credit risk"—saying that the company's "profitability is likely to remain weak and volatile." On 6 February 2014, Sony announced it would trim as many as 5,000 jobs as it attempts to sell its PC business and focus on mobile and tablets. In 2014, Sony South Africa closed its TV, Hi-Fi and camera divisions with the purpose of reconsidering its local distribution model and, in 2017, it returned facilitated by Premium Brand Distributors (Pty) Ltd. In November 2011, Sony was ranked 9th (jointly with Panasonic) in Greenpeace's Guide to Greener Electronics. This chart grades major electronics companies on their environmental work. The company scored 3.6/10, incurring a penalty point for comments it has made in opposition to energy efficiency standards in California. It also risks a further penalty point in future editions for being a member of trade associations that have commented against energy efficiency standards. Together with Philips, Sony receives the highest score for energy policy advocacy after calling on the EU to adopt an unconditional 30% reduction target for greenhouse gas emissions by 2020. Meanwhile, it receives full marks for the efficiency of its products. In June 2007, Sony ranked 14th on the Greenpeace guide. Sony fell from its earlier 11th-place ranking due to Greenpeace's claims that Sony had double standards in their waste policies. As of May 2018[update] Greenpeace's 2017 Guide to Greener Electronics rated Sony approximately in the middle among electronics manufacturers with a grade of D+. Since 1976, Sony has had an Environmental Conference. Sony's policies address their effects on global warming, the environment, and resources. They are taking steps to reduce the amount of greenhouse gases that they put out as well as regulating the products they get from their suppliers in a process that they call "green procurement". Sony has said that they have signed on to have about 75 percent of their Sony Building running on geothermal power. The "Sony Take Back Recycling Program" allow consumers to recycle the electronics products that they buy from Sony by taking them to eCycle (Recycling) drop-off points around the U.S. The company has also developed a biobattery that runs on sugars and carbohydrates that works similarly to the way living creatures work. This is the most powerful small biobattery to date. In 2000, Sony faced criticism for a document entitled "NGO Strategy" that was leaked to the press. The document involved the company's surveillance of environmental activists in an attempt to plan how to counter their movements. It specifically mentioned environmental groups that were trying to pass laws that held electronics-producing companies responsible for the cleanup of the toxic chemicals contained in their merchandise. Sony Corporation is actively involved in the EYE SEE project conducted by UNICEF. EYE SEE digital photography workshops have been run for children in Argentina, Tunisia, Mali, South Africa, Ethiopia, Madagascar, Rwanda, Liberia and Pakistan. Sony assists The South Africa Primary Education Support Initiative (SAPESI) through financial donations and children book donations to the South Africa Mobile Library Project. The Sony Canada Charitable Foundation (SCCF) is a non-profit organization which supports three key charities; the Make-A-Wish Canada, the United Way of Canada and the EarthDay and ECOKIDS program. After the 2011 Queensland floods and Victorian bushfires, Sony Music released benefit albums with money raised going to the Sony Foundation. You Can is the youth cancer program of Sony Foundation. Sony launched its Open Planet Ideas Crowdsourcing Project, in partnership with the World Wildlife Fund and the design group, IDEO. On the occasion of the 2014 World Cup in Brazil, Sony partnered with streetfootballworld and launched the Street Football Stadium Project to support football-based educational programmes in local communities across Latin America and Brazil. More than 25 Street Stadiums were developed since the project's inception. ^ "Sony Global - Sony Global - Corporate History". www.sony.net. Retrieved 18 July 2018. ^ "Corporate Data". Sony Corporation. 31 March 2018. Retrieved 3 April 2019. ^ a b c "Q3 FY2017 Consolidated Financial Results" (PDF). Sony Corporation. 2 February 2018. Retrieved 3 April 2019. ^ "Financial Statements and Consolidated Financial Results for the Fiscal Year" (PDF). Sony Corporation. 27 April 2018. Retrieved 3 April 2019. ^ "Sony". fortune.com. Fortune Media IP Limited. Retrieved 3 April 2019. ^ "Access & Map." Sony Global. Retrieved 6 December 2011. "1–7–1 Konan Minato-ku, Tokyo 108-0075, Japan" – Map – Address in Japanese: "〒108-0075 東京都港区港南1–7–1"
^ "Consolidated financial results for the fiscal year ended March 2016, Sony Corporation" (PDF). ^ a b c Sony Corporate History (Japanese). Sony.co.jp. Retrieved 7 July 2011. ^ "Sony 2018 Global 500 – Fortune". Fortune. ^ Organization Data. Sony.net. Retrieved on 25 April 2012. ^ a b Business Overview, Annual Report 2010. (PDF). Retrieved 7 July 2011. ^ Organization Data. Sony.net. Retrieved 7 July 2011. ^ Top 20 semiconductor sales leaders for Q1 2016. Retrieved 26 February 2015. ^ "Sony like.no.other Global Brand Development". Blind. Archived from the original on 17 November 2016. Retrieved 16 November 2016. ^ Christopher MacManus (2 September 2009). "Sony Insider. 2010-10-27. Retrieved 2016-08-07". Sonyinsider.com. Retrieved 21 April 2017. ^ "Sony Global - History". www.sony.net. Retrieved 7 July 2017. ^ a b c d "Sony Global – Sony History". Archived from the original on 28 November 2006. Retrieved 16 February 2007. ^ "World: Asia-Pacific Sony co-founder dies". BBC. 3 October 1999. Retrieved 27 May 2012. ^ Chang, Sea-Jin (25 February 2011). Sony vs Samsung: The Inside Story of the Electronics Giants' Battle For Global Supremacy. John Wiley & Sons. ISBN 9780470830444. ^ Sony.co.uk. About Sony. The History of the Sony Corporation Archived 28 November 2013 at the Wayback Machine. Sony.co.uk. Retrieved 7 July 2011. ^ a b c d e f Christian, Caryl, and With Hideko Takayama and Kay Itoi in Tokyo, George Wehrfritz in Hong Kong, John Sparks and Michael Hastings in, New York. "Sony is Not Japan; the Appointment of a Foreign CEO is a Sign of how Far the Iconic Company has Fallen in the Japanese Corporate Elite." Newsweek 21 March 2005: 30-. ProQuest Research Library. Web. 26 May 2012. ^ a b c d Lohr, Steve. "Hard-Hit Sony Girds for a Fight in the American Electronics Market." New York Times: A.8. New York Times. 14 August 1983. Web. 26 May 2012. ^ a b "Digication e-Portfolio :: Navaldeep Singh :: Investigate and Analyze the company's History and Growth". stonybrook.digication.com. Retrieved 4 June 2017. ^ a b c d e f g Fackler, Martin. "Cutting Sony, a Corporate Octopus, Back to a Rational Size." New York Times: C.1. New York Times. 29 May 2006. Web. 27 May 2012. ^ a b c d Nakamoto, Michiyo. "Screen Test: Stringers Strategy Will Signal to what Extent Sony can Stay in the Game CONSUMER ELECTRONICS: The Japanese Company that Once Brought the World Market-Defining Products is being Trounced by More Agile Competitors and must Decide which Activities no Longer Form Part of its Future, Writes Michiyo Nakamoto." Financial Times: 17. ABI/INFORM Global. 21 September 2005. Web. 27 May 2012. ^ Jeff Blagdon (27 March 2012). "Sony reorganizes into 'One Sony', prioritizes digital imaging, gaming and mobile". The Verge. Retrieved 10 July 2013. ^ Knight, Sophie; Reiji Murai (6 February 2014). "As losses mount, Sony's Hirai seeks cure for TV business in spinoff". Reuters. Tokyo. Retrieved 11 February 2014. ^ "Sony to shutter two-thirds of its US stores". Engadget. 26 February 2014. Retrieved 27 February 2014. ^ Makuch, Eddie (16 April 2014). "PS4 company Sony to sell its entire stake in Square Enix, valued at around $47 million". GameSpot. Retrieved 16 April 2014. ^ "Sony, Shanghai Oriental Pearl to set up China PlayStation JVs". Reuters. 25 May 2014. ^ a b Aldrich, Rachel (12 December 2016). "Why would Sony merge its gaming and film units?". TheStreet. ^ Atkinson, Claire (12 December 2016). "Sony considers merging gaming and film divisions". New York Post. ^ Cooke, Chris. "Revamp of Sony's entertainment business could more closely align Sony Music with Sony/ATV | Complete Music Update". ^ Ma'arif, Nelly Nailaite (2008). "15". The Power of Marketing. Penerbit Salemba. ^ Curtis, Sophie (10 November 2015). "Sony is finally killing off Betamax video tapes". ISSN 0307-1235. Retrieved 4 January 2019. ^ a b "The History of Format Wars and How Sony Finally Won... For Now". pastemagazine.com. Retrieved 4 January 2019. ^ "Digital Betacam (1993 – 2016)". Museum of Obsolete Media. 28 May 2014. Retrieved 7 January 2019. ^ "Video8 (1985 – 2000s)". Museum of Obsolete Media. 27 May 2014. Retrieved 4 January 2019. ^ "What's DAT Sound?". Bitstreams: The Digital Collections Blog. 10 October 2014. Retrieved 4 January 2019. ^ Haire, Meaghan (1 July 2009). "The Walkman". Time. ISSN 0040-781X. Retrieved 17 January 2019. ^ "MiniDisc (1992 – 2013)". Museum of Obsolete Media. 16 November 2013. Retrieved 17 January 2019. ^ a b "Sony Digitial Dynamic Sound". www.cs.cmu.edu. Retrieved 1 February 2019. ^ a b Nailatie., Ma'arif, Nelly (2008). The power of marketing : practitioner perspectives in Asia. Penerbit Salemba Empat. ISBN 9789796914456. OCLC 968144111. ^ "Why isn't SDDS in the consumer market?". Blu-ray Movie Discussion, Expert Reviews & News. Retrieved 1 February 2019. ^ Waniata, Ryan (7 February 2018). "The Life and Times of the Late, Great CD". digitaltrends.com. Retrieved 1 February 2019. ^ "Sony History on development of Magneto Optical Discs". 2007. Archived from the original on 24 December 2006. Retrieved 6 February 2007. ^ Ma'arif, Nelly Nailatie (2008). Power of Marketing. Penerbit Salemba. ISBN 9789796914456. ^ "Sony Group Organization Chart". Sony.net. Retrieved 12 May 2014. ^ "Consolidated Financial Results for the First Quarter Ended June 30, 2014" (PDF). Retrieved 1 February 2016. ^ "Q3 FY2015 Consolidated Financial Results Presentation Slides" (PDF). Retrieved 1 February 2016. ^ "Dell Details on Notebook Battery Recall". Direct2Dell. 14 August 2006. Archived from the original on 20 August 2006. Retrieved 21 August 2006. ^ "Dell announces recall of 4.1 million laptop batteries". CBC News. 14 August 2006. Retrieved 28 September 2006. ^ "Sony, Dell battery issue heats up". CBC News. 24 August 2006. Retrieved 24 August 2006. ^ "Tablet & Smartphones | Xperia™ Tablet & Smartphones". Sony. 30 July 2009. Retrieved 10 July 2013. ^ Smith, Mat (6 February 2014). "Sony sells its VAIO PC business, makes TV arm its own subsidiary". Engadget. Retrieved 6 February 2014. ^ Catherine Shu (6 February 2014). "Sony To Exit PC Business By Selling VAIO". TechCrunch. AOL, Inc. Retrieved 7 February 2014. ^ a b Yang, Jun; Yasu, Mariko (23 May 2012). "Sony, Samsung Ask U.S. Retailers to Curb Discounts on TV Sets". Bloomberg. ^ "Sony sells $940m LCD stake to Samsung to slash TV losses". Retrieved 27 December 2011. ^ "Sony and Sharp in LCD panel joint venture". Sony.net. Retrieved 12 May 2014. ^ "Sony Announces It Will Stop Producing Betamax Tapes in March 2016". NBC News. 9 November 2015. Retrieved 10 November 2015. ^ "Sony to launch space business". Nikkei Asian Review. Retrieved 21 April 2018. ^ "Announcement of Agreements Between Olympus and Sony to Form Business and Capital Alliance" (PDF). Olympus-global.com. Retrieved 12 May 2014. ^ "Establishment of Sony Olympus Medical Solutions Inc" (Press release). Sony Olympus Medical Solutions. 16 April 2013. Retrieved 19 April 2013. ^ "Establishment of a New Company to start genome information platform business" (Press release). Sony Corporation. 23 January 2014. Retrieved 16 May 2014. ^ a b "Sony and Ericsson complete joint venture agreement" (Press release). Sony. 28 August 2001. Retrieved 26 May 2012. ^ nonmember. Telecoms Korea. Retrieved on 11 July 2011. ^ "Gartner Says Worldwide Mobile Device Sales to End Users Reached 1.6 billion Units in 2010; Smartphone Sales Grew 72 Percent in 2010: Apple and RIM Displaced Sony Ericsson and Motorola in Mobile Device Manufacturers Ranking". gartner.com. 9 February 2011. ^ Kim, Yuri (30 November 2015). "美·유럽 이어 캐나다서도…소니 첫 '4K 화면폰' 출시". 2015-11-30. ^ "Topic: Sony". www.statista.com. Retrieved 23 March 2016. ^ "The PlayStation Quest." Macleans 6 November 2000: 81-. ABI/INFORM Global; ProQuest Research Library. Web. 27 May 2012. ^ Pilling, David. "Camera Sales Raise Sonys Game." Financial Times: 23. ABI/INFORM Global. 27 July 2007. Web. 27 May 2012. ^ Makuch, Eddie. "PS3 overtakes Xbox 360 in worldwide shipments – Report". GameSpot. Archived from the original on 21 March 2013. ^ "PLAYSTATION 4 SELLS 5.9 MILLION UNITS WORLDWIDE DURING THE 2017 HOLIDAY SEASON" (Press release). San Mateo: Sony Interactive Entertainment Inc. 8 January 2018. Retrieved 16 April 2018 – via sie.com. ^ "Sony leads virtual reality patent race". hypergridbusiness.com. ^ Layden, Shawn (13 October 2016). "PlayStation VR Launches Today Across the United States and Canada". ^ "NRG eVgo Completes Largest Corporate Installation of Electric Vehicle Charging Stations in Southern California - EV News Report". EV News Report. ^ Joseph Volpe. "Sony eyes electric car future, wants to soon sell you Li-ion batteries". Engadget. AOL. ^ "Sony CEO says will explore tie-ups in EV batteries - Electric Vehicle News". electric-vehiclenews.com. ^ Sony to make batteries for electric cars. Silicon Republic. ^ "Sony reveals self driving car ambitions". hexus.net. ^ "ZMP Inc. - 次世代モビリティ・EV開発用プラットフォーム　RoboCar® MV2". zmp.co.jp. ^ "Signing of Memorandum of Understanding for the Transfer of Battery Business" (Press release). Murata Manufacturing Co., Ltd. & Sony Corporation. 28 July 2016. Retrieved 6 October 2016. ^ "Sundstrand Selling Trans Com Systems To Sony". 10 July 1991. Retrieved 12 August 2018. ^ "Rockwell Collins Acquires Sony Trans Com". 1 June 2000. Retrieved 12 August 2018. ^ "2011 Market Share and Box Office Results by Movie Studio". Box Office Mojo. 31 December 2011. Retrieved 9 November 2012. ^ Bates, James; Claudia Eller (20 November 1996). "Sony President Puts Best Face on Studio Woes". Los Angeles Times. p. D1. ^ "Legal fight over fake film critic". BBC News. 2 March 2004. ^ Emanuella Grinberg (9 March 2004). "Moviegoers to settle with studio after being lured by phony critic". CNN. ^ "Sony pays $1.5m over fake critic". BBC News. 3 August 2005. ^ "Sony admits, fixes problem with DVD DRM". Ars Technica. ^ Brown, Bob (1 November 2010). "Sony BMG rootkit scandal: 5 years later". Network World. Retrieved 20 February 2015. ^ "Sony to Buy Gracenote Music Data Company". abcnews.go.com. 23 April 2008. Retrieved 11 February 2015. ^ Halperin, Shirley (30 June 2012). "Sold! EMI Music Publishing to Consortium Led by Sony/ATV, Michael Jackson Estate for $2.2 Billion". The Hollywood Reporter. ^ Christman, Ed (30 September 2012). "Sony Finalizes Acquisition of Michael Jackson Estate's Stake in Sony/ATV Publishing". Billboard. Retrieved 1 October 2016. ^ Tim Clark and, Carl K. "Out of Service." New York Times: A.25. New York Times. 9 March 2005. Web. 27 May 2012. ^ Alpeyev, Pavel; Huang, Grace (15 October 2015). "Sony's Answer to Apple Pay Is Laying Tracks for Asian Expansion". Bloomberg Business. Retrieved 19 October 2015. ^ "Sony sees return to profit, aims to halve TV losses". Reuters. 10 May 2012. ^ a b c d "Sony: Too Much make-Believe." FT.com (2011): n/a. ABI/INFORM Global; ProQuest Research Library. Web. 26 May 2012. ^ Fujimura, Naoko (12 December 2011). "Sony's Shopping Spree Is 'Wrong Direction' in Apple Battle: Tech". Bloomberg. Retrieved 18 December 2011. ^ 10 Year Financials of sne – Sony Corp Adr. Gurufocus.com. Retrieved on 25 April 2012. ^ McCurry, Justin (9 December 2008). "Sony to cut 8,000 jobs worldwide". The Guardian. London. Retrieved 23 May 2010. ^ "Sony expected to slash 10,000 jobs". Retrieved 9 April 2012. ^ Yasu, Mariko; Ozasa, Shunichi (11 April 2012). "Sony, Sharp Losing $11 Billion Leaves Investors Let Down". Bloomberg. ^ "Sony ups ad spend to Rs.450 cr". The Hindu. 7 June 2012. ^ Ewing, Adam; Yasu, Mariko (23 August 2012). "Sony to Cut 1,000 Jobs to Reduce Costs at Mobile Unit". Bloomberg. ^ Reuters (18 January 2013). "Sony to sell its U.S. headquarters building for $1.1 billion". Reuters. ^ Chilson, Morgan. "Labels Sony Credit Rating 'Junk' Amid Lower Demand". Article. Moneynews. Retrieved 28 January 2014. ^ "Sony to cut as many as 5,000 jobs, unload Vaio". USA Today. Retrieved 6 February 2014. ^ "Guide to Greener Electronics 17th Edition". Greenpeace International. November 2011. Retrieved 20 August 2018. ^ a b "Guide to Greener Electronics". Greenpeace International. Greenpeace International. Retrieved 16 November 2011. ^ "Greener electronics Sony ranking: Fourth Edition". Greenpeace International. 27 June 2007. Retrieved 20 August 2018. ^ Samson, Ted (9 July 2007). "Sony hits bottom of Greenpeace eco rankings". InfoWorld. Retrieved 5 October 2010. ^ "Guide to Greener Electronics (2017)". Greenpeace International. Retrieved 17 May 2018. ^ "History of Environmental Activities at Sony". Archived from the original on 8 February 2008. Retrieved 1 November 2007. CS1 maint: BOT: original-url status unknown (link). Retrieved 7 July 2011. ^ "Sony Group Environmental: Vision". Archived from the original on 27 November 2007. Retrieved 1 November 2007. CS1 maint: BOT: original-url status unknown (link). Web.archive.org. (27 November 2007). Retrieved 7 July 2011. ^ Sony develops World's Most Powerful Sugar-based Bio Battery Prototype. Techgadgets.in (24 August 2007). Retrieved 7 July 2011. ^ Knight, Danielle (22 September 2000). "Sony's PR War on Activists". Mother Jones. Retrieved 5 October 2010. ^ "UNICEF and Sony photo workshop promotes rights with Darwin's indigenous youth". unicef.org.au. Archived from the original on 16 May 2013. ^ "Seeing Mali: a digital project for children - in pictures". TheGuardian.com. 16 June 2011. ^ "Sony helps S African mobile library project". japantoday.com. Retrieved 11 February 2015. ^ Cashmere, Paul (5 October 2012). "Sony Foundation Funds Salvos Sound Point Centre In Goodna". noise11.com. Retrieved 11 February 2015. ^ "Sony Foundation raises over $880k with Wharf4Ward". mcvpacific.com. 24 October 2014. ^ Beavis, Simon (26 May 2011). "Sony – engaging untapped audience through crowdsourcing". TheGuardian.com. ^ "Stadiums to go: streetfootballworld partners with Sony to support Brazilian and Latin American communities –". streetfootballworld. 7 March 2014. Archived from the original on 11 February 2015. ^ "Sony Street Stadiums –". streetfootballworld. 7 March 2014. The Portable Radio in American Life by University of Arizona Professor Michael Brian Schiffer, PhD (The University of Arizona Press, 1991).